This is the Canon 50mm lens you have been waiting for. When introducing the Canon EOS R and the RF mount, Canon's first full frame lens mount introduced since the EF (electronic focusing) mount was introduced over 30 years ago, Canon primed the pump with some knock-out lenses and the RF 50mm F1.2 L USM Lens was one of them. While wide-aperture 50mm prime lenses have long been favorites with photographers, few have had even marginally good image quality at their widest aperture. Stopping down to at least f/2 or f/2.8 was necessary to gain the resolution and contrast typically desired. Sure, the dreamy effect can be useful at times, but ... I much prefer sharp, high contrast results and this lens delivers those at f/1.2. In addition to impressive image quality, the Canon RF 50mm F1.2 L USM Lens has professional-grade build quality and fast, very accurate AF. Combine those qualities with a general purposes focal length and the end result will be a most-used lens in many kits. Note that you will need an RF-mount camera (the EOS R-series) to mount this lens on, but ... this lens is good enough that buying an RF-mount camera just to use it on makes perfect sense. Sometimes, it is easy to justify the purchase of a lens for a subset of its attributes, but when it is time to select the ideal lens for a particular use, the focal length always becomes a very important attribute. The focal length determines the angle of view which determines the subject distance required for the desired framing and the distance from the subject determines the perspective. The 50mm focal length is ultra-popular due to its great number of uses. On a full frame body, a 50mm focal length provides an angle of view that seems natural and that brings great general purpose usefulness. So useful that 50mm (or very similar) focal length prime lenses are found in all major brand lens lineups, with some having numerous options (Canon has five 50mm prime lenses at review time). Fifty mm lenses are frequently used in fashion, portraiture, weddings, documentary, street, lifestyle, sports, architecture, landscape, commercial, around-the-home and general studio photography applications including product photography. As you likely noted, a number of the good applications for this lens include people as subjects. While a 50mm lens used (on a full frame body) is modestly too wide angle for tightly framed head shot portraits (a too-close perspective is required, at least for my taste, example shared later), but it is great for wider portrait framing. Having a 50mm focal length and f/1.2 aperture available opens many artistic opportunities, including those found in nature. 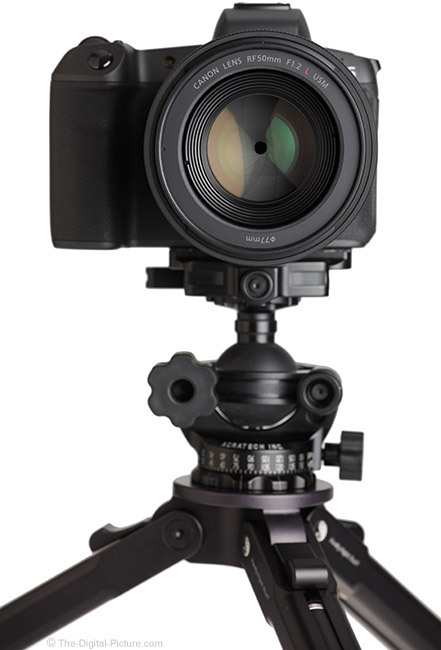 At review time, this lens is not compatible with any APS-C (1.6x FOVCF) format cameras. Should that scenario change in the future, or should an R-series cameras' 1.6 crop mode be used, the full frame angle of view equivalent becomes 80mm. This angle of view works for similar subjects, with more working space required and tighter framed headshot portraits having better perspective. As of review time, f/1.2 is the widest aperture available in a current model autofocus lens and there are very few lenses available with apertures wider than that of the RF 50mm F1.2 L. The f/1.2 aperture is a big deal. Use ultra-wide apertures to stop action, both that of the subject and that of the camera, in very low light levels and/or with low ISO settings. Use ultra-wide apertures to create a strong bakcground blur that makes a subject pop from an even highly distracting background. 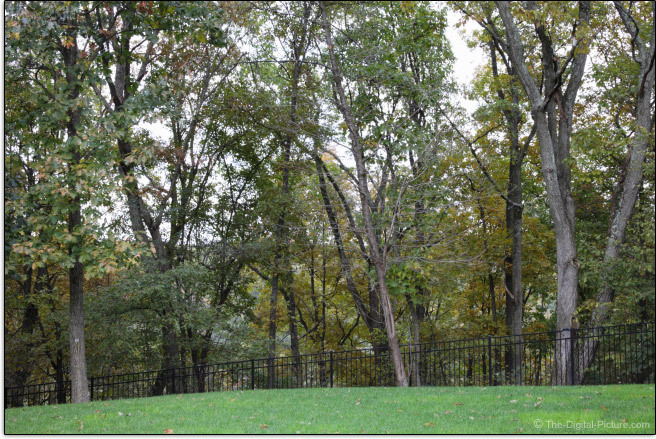 Here is an aperture comparison example. 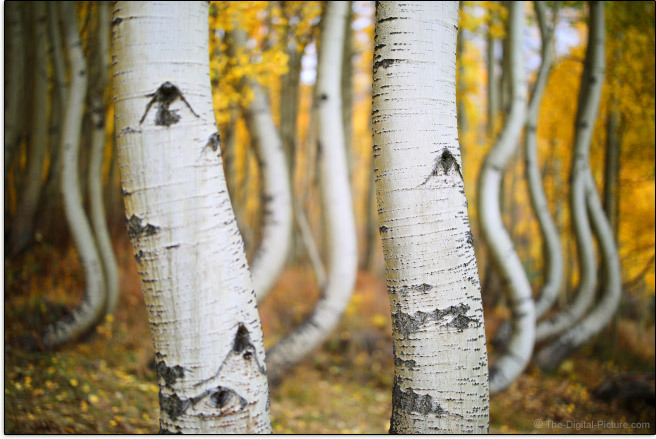 At f/1.2, the foreground trees stand out against the blurred background trees and the viewer's eye is directed to them (even one of the foreground trees is slightly blurred in the shallow depth of field illustrated here). At f/16, the background trees appear to be part of the image and that is of course sometimes desireable. Compare your current 50mm lens' widest aperture to f/1.2. Opening an aperture wider means larger lens elements and larger lens elements mean increased size, weight and price. This lens incorporates those features, though not in extreme fashion. Note that, especially under full sun conditions and especially with a bright white subject (such as a boat or wedding dress), a 1/8000 sec. shutter speed may be only marginally fast enough to avoid blown highlights at f/1.2. Shooting with a narrower aperture is an option, but a neutral density or, in some situations, a circular polarizer filter will darken the image enough for a 1/8000 sec. shutter speed to be adequate. Above is a look at the maximum background blur this lens can produce. An ultra-wide aperture lens is generally selected to make use of ultra-wide apertures. Often, especially with 50mm ultra-wide aperture lenses, the image quality at the widest apertures is not good and, as mentioned at the beginning of the review, often described as "dreamy". While dreamy can be a nice touch on occasion, it is not usually what I am going for. With this lens, you get what you want. F/1.2 results are very sharp, showing strong resolution and good contrast across the entire full frame image circle, including extreme corners. Stopping down to f/2 produces a slight increase in sharpness and very slightly more can be seen at f/2.8. I have not hesitated to use the RF 50 f/1.2 wide open and ... haven't stopped it down very often. In addition to our standard lab tests, I like to share some real world examples. The images below are 100% resolution crops from images captured in RAW format using a Canon EOS R. The images were processed in DPP using the Standard Picture Style with a sharpness setting of "2". These examples are from mid-frame. 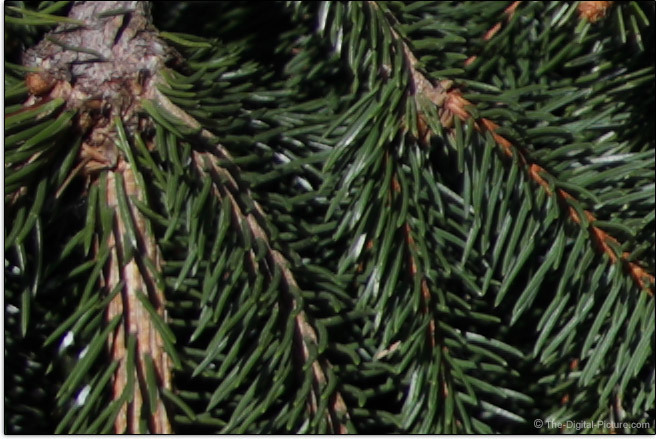 Be sure to make evaluations using the center of depth of field, located approximately at the most-centered bud. Notice in the spruce tree example that the middle of the depth of field stays nicely centered on the focused-on subject as the aperture narrows. Focus shift is not an issue. If you want to see a lens' worst performance, the extreme corners are the easy place to find it and in this case you are going to like the worst case. Following is a set of extreme-top-left-corner 100% crop examples captured and processed identically to the above examples. Those results are very impressive. Stopping down decreases peripheral shading, but the f/1.2 sample has excellent resolution. Lenses project a circle of light onto the image sensor. The physical properties of light passing through a lens make it impossible for the same amount of light to reach the edges of the circle as the center, resulting in a darkening of the corners, referred to as vignetting. You can count on ultra-wide aperture lens images to show vignetting and the question is, how much? The about-4-stops of corner shading this lens shows at f/1.2 is going to be noticeable in most images. 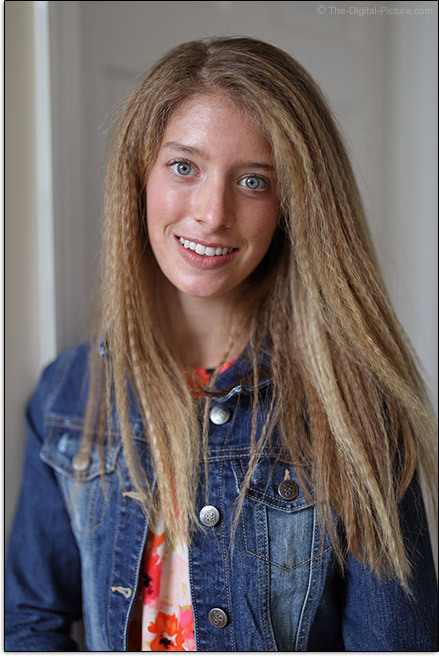 Especially with portraits featuring a non-centered subject, at least some correction will often be desired. Using an f/2 aperture reduces the shading by about 50% with roughly 2 stops remaining. At f/2.8, the amount drops to around 1.5 stops and to just over a stop, often referenced as the vignetting visibility level, at f/4. Only minor improvement is seen at narrower aperture settings with about 1 stop of shading remaining at f/16. Note that the RF 50 F1.2 L shows very slightly more peripheral shading, about 0.5 stops more at any given aperture, than the Canon EF 50mm F1.2 L USM Lens. As referenced, vignetting can be corrected during post processing with increased noise in the brightened areas being the penalty. Since f/1.2 often facilitates a low ISO, the correction penalty is often low. Vignetting can also be simply embraced, using the effect to draw the viewer's eye to the center of the frame. The effect of different colors of the spectrum being magnified differently is referred to as lateral (or transverse) CA (Chromatic Aberration). Lateral CA shows as color fringing along lines of strong contrast running tangential (meridional, right angles to radii) with the mid and especially the periphery of the image circle showing the greatest amount as this is where the greatest difference in the magnification of wavelengths typically exists. While lateral CA is usually easily corrected with software (often in the camera) by radially shifting the colors to coincide, it is of course better to not have it in the first place. Any color misalignment present can easily be seen in the site's image quality tool, but let's also look at a worst-case example, a 100% crop from the extreme top left corner of an EOS R frame. Len designers, especially when creating a premium grade prime lens, typically do a great job of mitigating this image quality defect and that is what we see here. The RF 50's lateral CA is very minor. As seen in the image quality tool's f/1.2 sample crops, this lens has excellent color alignment on the plane of sharp focus, but as seen in the above example, the foreground and background periperhal blur colors do show some color differences/separation at f/1.2. Lens flare occurs when a bright light source is within or just outside the image frame, resulting in internal reflections from lens elements appearing in the image. 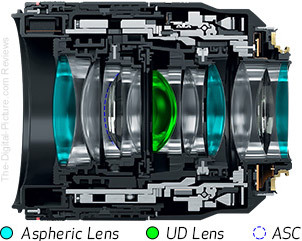 This lens features Canon's Super Spectra and Air Sphere Coating (ASC), designed to reduce flare and ghosting. Flare effects can be embraced, avoided or removal can be attempted. If not embraced or avoided, flare effects can be destructive to image quality and these are sometimes extremely difficult to remove in post processing. At f/1.2 with the sun in the corner of the frame, this lens shows a low amount of flaring. Stop down to f/16, and the flaring rises to a modest level, but considering that this lens has 15 elements in 9 groups, the amount is not bad at all. There are two lens aberrations that are particularly evident when shooting images of stars, mainly because bright points of light against a dark background make them easier to see. Coma occurs when light rays from a point of light spread out from that point, instead of being refocused as a point on the sensor. Coma is absent in the center of the frame, gets worse toward the edges/corners and generally appears as a comet-like or triangular tail of light which can be oriented either away from the center of the frame (external coma) or toward the center of the frame (internal coma). Coma becomes quite visible mid-frame and in the corners of images captured at wide apertures and significantly resolves when the lens is stopped down. Astigmatism is seen as points of light spreading into a line, either meridional (radiating from the center of the image) or sagittal (perpendicular to meridional). The following 100% crop was taken from the top right corner of an EOS R frame centered on the north star. 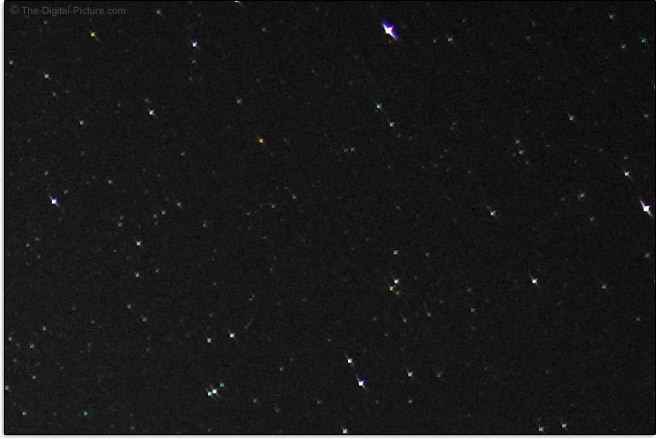 Yes, the stars in the image have wings and the real ones do not, showing that the corners are not completely perfect, at least not at infinity focus distance. 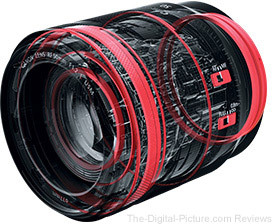 Prime lenses typically have very low amounts of geometric distortion and that is the case with this lens. 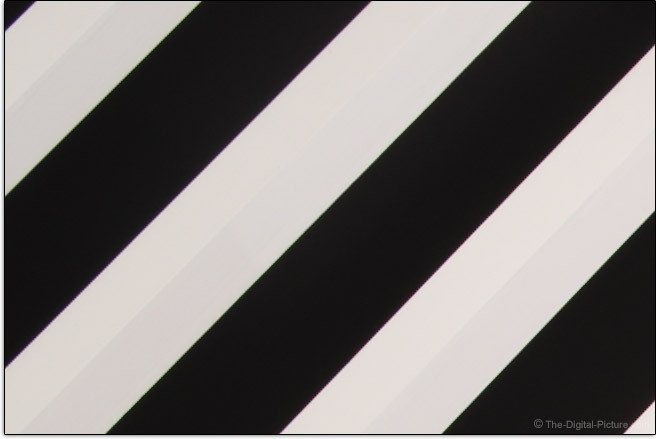 With pratically no linear distortion (just the slightest hint of barrel distortion), you are safe to place straight lines along the borders of your frames – they will remain straight. Most modern lenses have lens correction profiles available for the popular image processing software and distortion can be easily removed using these, but distortion correction is destructive at the pixel level and using a distortion-free lens is a better option. 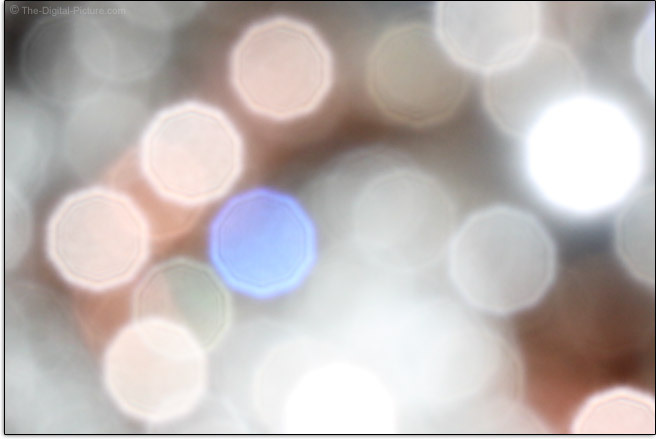 The first f/8 image was captured indoors and illustrates the lens' performance with out of focus highlights. This performance is very nice with remarkably-smooth interiors and a nice transition at the periphery. For being stopped down over 5 stops, the roundness of these blurs is also very nice. The two outdoor examples next-following also appear nice. 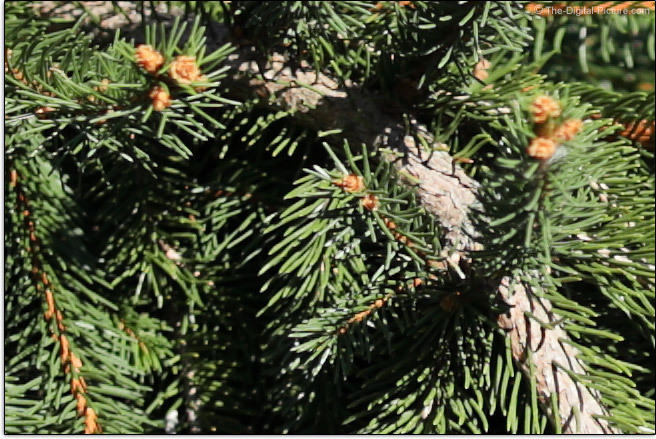 The CE example (cropped and reduced) looks at an f/1.2 top right corner where some cats eye bokeh, a form of mechanical vignetting, can be seen. 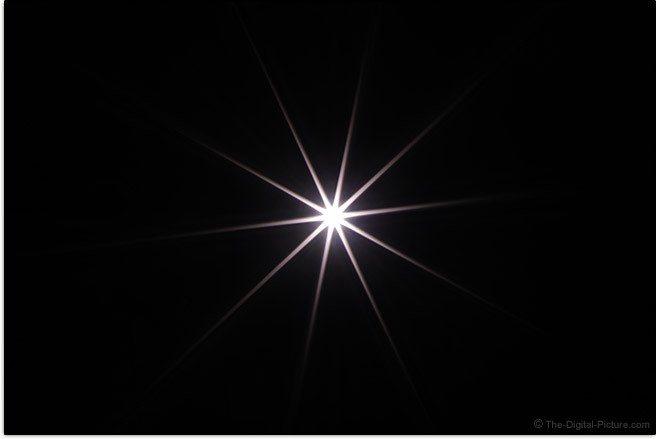 With a 10-aperture blade count, an even number, distant point light sources captured with a narrow aperture will show 10 point stars. Wide aperture lenses usually create great stars and this lens is no exception. The star has a very clean shape with sharp points and it is big. This effect will look great when showing in your results. Canon EOS owners have long been waiting for a 50mm lens with image quality approaching that of this one. While some peripheral shading will be present in wide aperture images and some spherical/axial CA exists, most will be extremely happy with their RF 50mm image quality. Especially when depth of field gets shallow, the importance of the combined AF accuracy of a camera and lens is elevated. 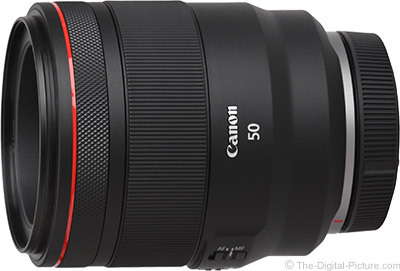 The Canon RF 50mm F1.2 L USM Lens receives a Ring-type USM (Ultrasonic Motor) driven AF system, common to high end Canon L-series lenses. Consistently accurate AF is always a primary concern. Based on many hundreds of test images (likely over a thousand), I have found one shot AF accuracy from the Canon RF 50mm F1.2 L USM Lens to be very impressive. In AI Servo tracking mode with a moderately-fast running subject, the RF 50's AF accuracy was very good, at least until the subject was quite close, roughly frame-filling distance. At that point, AF seemed to no longer keep up, but this is not surprising as the closing rate is very fast at that distance. With medium and short distance adjustments, this lens focuses quite fast. When performing a near-full range autofocus adjustment, you will notice some lag. Helping in this regard is a focus limiter switch, enabling the focus range to be limited to 2.62' (0.8m) - ∞ or permitting the full range. Under extreme low light conditions, focus is also slowed. This is normal, but normal happens in darker environments with this lens – the Canon EOS R can focus in extreme low light levels (-6 EV with an f/1.2 lens). The R and RF 50 F1.2 L combination can focus on a bright star in a medium-dark sky. It can focus, with the AF assist light blocked, in darkness that I cannot see to safely navigate in. This performance is quite impressive. From an audibility perspective, the RF 50 makes some light clicking/clunking during AF and a SHHHH can be heard during longer focus distance changes. This lens is not as quiet during autofocusing as the Canon RF 24-105mm F4 L IS USM Lens I just reviewed, but it is not loud. Expect on-board audio recording to pick up these sounds. While the sound is deceptive from a smoothness perspective, the EOS R focuses this lens relatively smoothly (a benefit for video recording). The focus ring is mid-sized and very adequate for a prime lens of this size. It turns slightly easier than I prefer, but holding a small amount of the fixed lens barrel while turning the ring adds some resistance. The RF 50 F1.2 L has a focus-by-wire or electrical manual focus (vs. a direct gear-driven system) implementation of Ring USM. The manual focus ring electronically controls the focus of the lens. FTM (Full Time Manual) focusing is supported in AF mode with the camera in One Shot drive mode, but the shutter release must be half-pressed for the focus ring to become active. Note that FTM does not work if electronic manual focusing is disabled in the camera's menu. The lens' switch must be in the "MF" position and the camera meter must be on/awake for manual focusing to be available. With electronics driving AF, the rate of focus change caused by the focus ring can be electronically controlled and it can be variable, based on the ring's rotation speed. I never acclimated to that feature and with the R-series cameras, a linear (non-variable) adjustment speed can be configured. That's my preference and in this mode, the RF 50 F1.2 L's focus is adjusted very slowly with 360° of ring rotation taking it from minimum focus distance to infinity, allowing for very precise focusing capabilities. Manual focus adjustments are mostly smooth, though I sometimes notice a slight jumpiness, hinting at the electronic manual focusing being featured. Moderate subject magnification/framing changes are seen in full extent focus range changes. This lens' aperture changes are quiet and smooth, ideally-suited for video recording under changing lighting conditions. No focus distance scale is provided on the RF lenses introduced as of review time, but a digital scale can be enabled in the electronic viewfinder or LCD. The RF 50mm F1.2 L has a 15.7" (400mm) minimum focus distance that delivers a 0.19x maximum magnification. While these numbers are not attention-garnering, they are decent in this lens class and noticeably better than the EF 50mm f/1.2L predecessor. Figure a subject measuring about 7.2 x 4.8" (183 x 122mm) filling the frame at minimum focus distance. 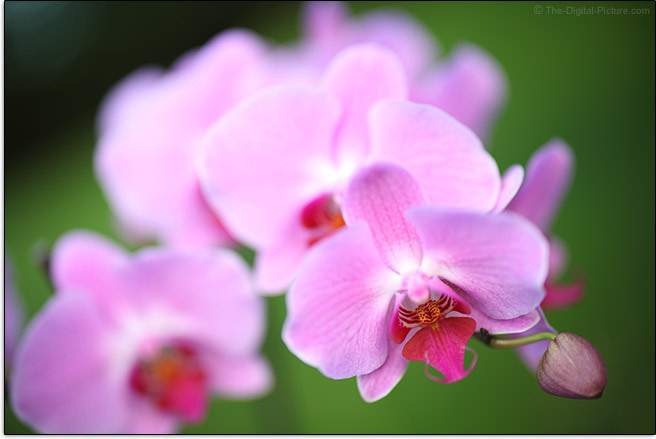 The orchid in the maximum blur image shared earlier in the review measures about 3.25" (83mm) in width and is rendered nicely-large in the frame. A minimum focus distance portrait is shared below. Notice how this portrait shows an uncomfortably close perspective? The nose appears too large relative to the rest of the face. Back up slightly to bring proportions back in line. Magnification from wide angle through standard/normal focal length lenses is generally significantly increased with the use of extension tubes, hollow tubes with electronic connections that shift a lens farther from the camera. As of review time, RF mount-compatible extension tubes do not exist. Watch for this accessory to become available. The Canon RF 50mm F1.2 L USM Lens is not compatible with Canon extenders. 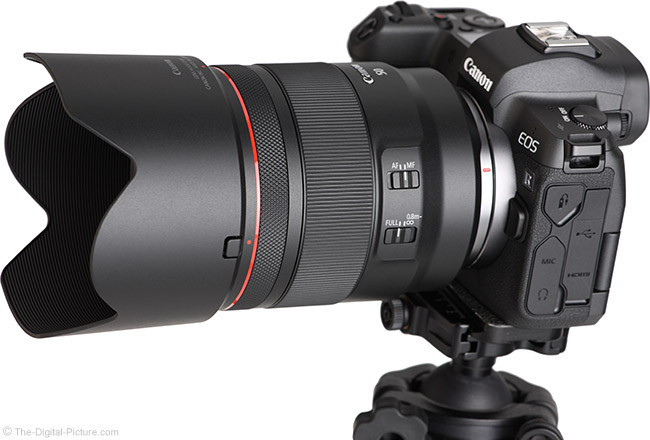 As a Canon L Series Lens, we know that the RF 50 F1.2 L is built for professional duty use. 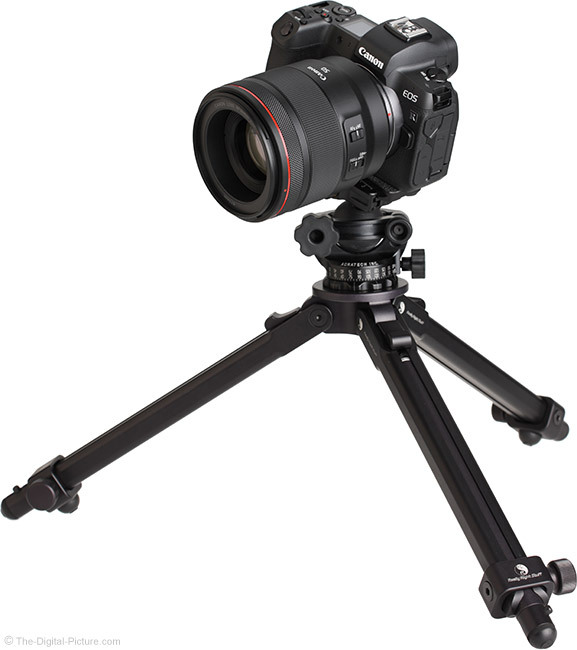 With smooth external dimensions, tight tolerance between parts and a fixed size, the Canon RF 50 L is very comfortable to hold and use, though it is somewhat large in diameter. This lens features a quality plastic external construction and the optics density required by the 50mm focal length combined with an f/1.2 aperture gives this lens a solid feel. RF lenses gain an additional ring, the knurled "Control Ring". This ring is configurable for fast access to camera settings including aperture, ISO, and exposure compensation. Note that the control ring is clicked by default and this ring's clicks are going to be audible in camera-based audio recordings. Canon offers a de-click service for this ring (at a cost). The focus ring is separated from the control ring by a small amount of space and, along with a texture difference, it is easy to tactilely find the ring you want. The AF/MF and Focus Limiter switches are flush-mounted on a very-low-profile switch bank, but just enough raised surface area is available for easy use, even with gloves. Interesting is that changing the AF/MF switch position opens the lens aperture momentarily when the camera is powered off and that the lens makes a faint noise (ear against the lens required to hear it) when the camera is powered up. This is a weather-sealed lens, not to be confused with a waterproof lens. Still, weather sealing can sometimes save the day. Like most other recent L lenses, the RF 50 F1.2 L features fluorine coatings on the front and rear lens elements to avoid dust adhesion and to make cleaning easier. This is one of those features that goes unnoticed until something happens in the field. Increased weight is always a penalty for an increased aperture opening. This lens has the latter and therefore has the former as well. While you will know that you are carrying this lens, the weight is moderate and easily manageable. 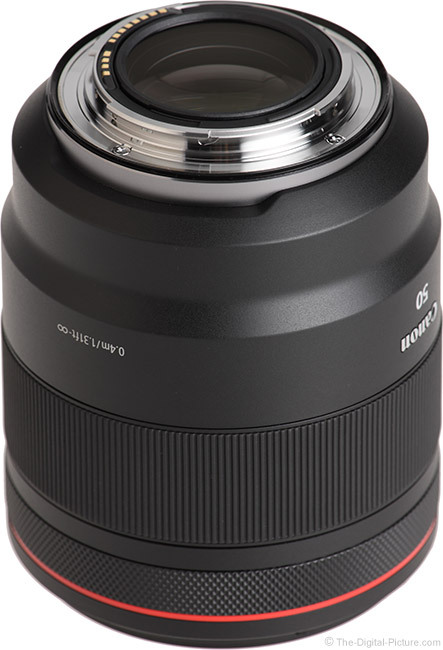 For many more comparisons, review the complete Canon RF 50mm F1.2 L USM Lens Specifications using the site's Lens Spec tool. Perhaps most notable is the size difference between the two 50 L lenses. The RF has definitely grown in size and the weight difference is similarly big. Of course, the R-series cameras are smaller and the non-RF-mount lenses require an adapter that increases their size noticeably when used on these cameras. The same lenses are shown below with their hoods in place. 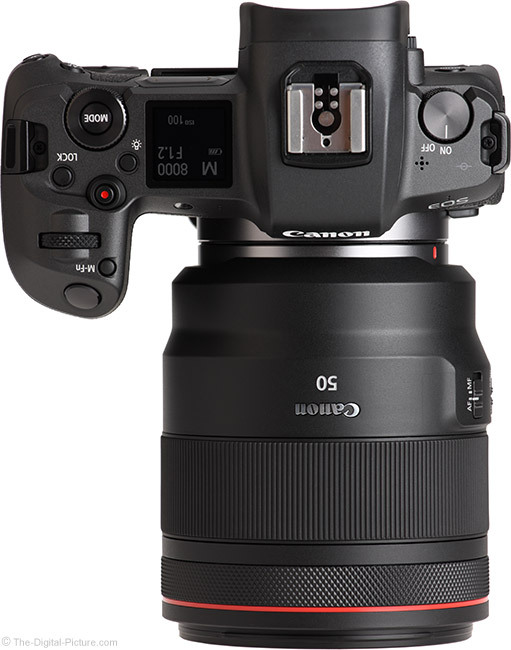 Use the site's product image comparison tool to visually compare the Canon RF 50mm F1.2 L USM Lens to other lenses. 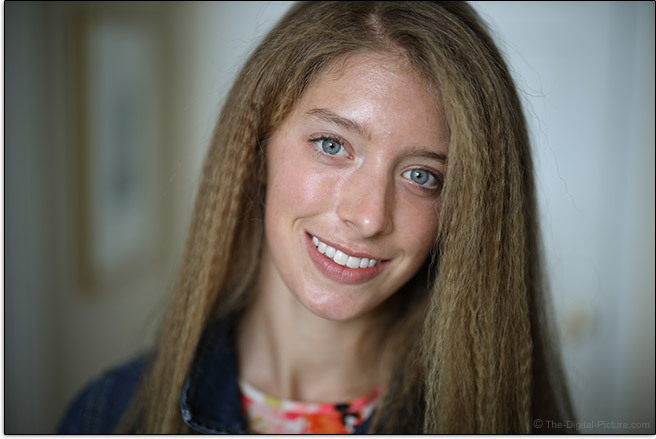 I preloaded the Canon EF 85mm f/1.2L USM Lens in that link as it makes another interesting comparison. 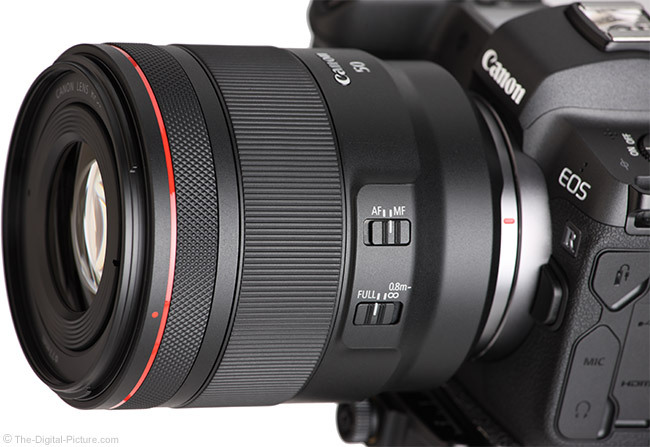 The Canon RF 50mm F1.2 L USM Lens utilizes the ultra-common 77mm-sized threaded filters. While this filter size is not especially small, that this size is likely shared among multiple lenses in your kit means that fewer filters may be needed in some scenarios and fewer in this case means less space and lower cost. Canon includes lens hoods for all L-series lenses and, with very few exceptions, you should always use them (and not in reversed position). The ES-83 is the hood model that comes with this lens. This is a semi-rigid plastic petal-shaped hood with a plastic-molded ribbed interior designed to avoid reflections. It offers a good amount of protection, both from impact and from bright light. Canon includes the soft-sided LP1319 drawstring pouch in the box. This is the same model shipped with the RF 24-105mm F4 L Lens. This pouch offers protective padding on the bottom, but the sides are unpadded, offering light scratch and dust protection. This lens comes with the very nice Canon E-77 II lens cap that has been shipping with other recent Canon 77mm-capped lenses. 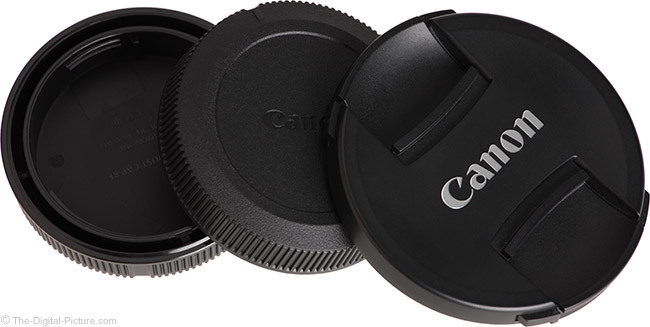 Along with the RF mount, Canon introduced a new mount cap, the robust Lens Dust Cap RF. Great lenses are seldom cheap and this one does not break that rule. While not crazy-high-priced, the RF 50 F1.2 L is priced high enough to be out of reach of most casual photographers. Professionals will appreciate that this lens can differentiate their work and many will not balk at this expenditure. 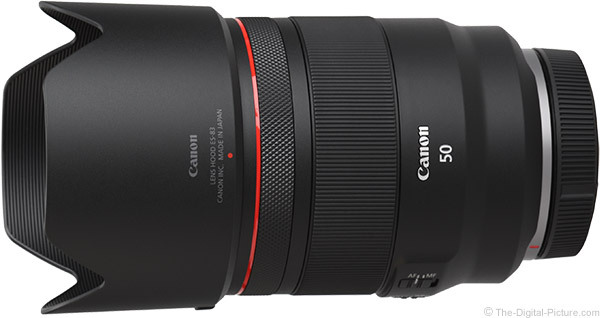 As an "RF" lens, the Canon RF 50mm F1.2 L USM Lens is compatible with all Canon EOS R series cameras. Canon USA provides a 1-year limited warranty. 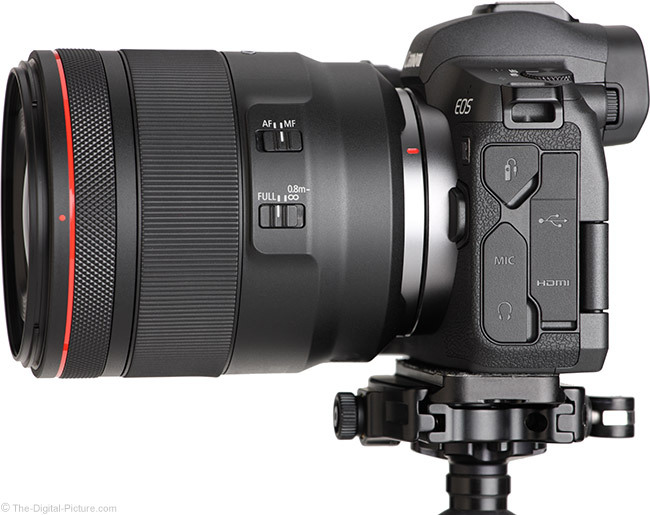 The reviewed Canon RF 50mm F1.2 L USM Lens was sourced from Canon USA. As of review time, there are no other RF 50mm lenses. If you want to cover 50mm with a different lens, one of the RF zoom lenses is your option. Of course, none of those options come close to the f/1.2 max aperture with the Canon RF 28-70mm F2 L USM Lens coming closest at this time. Otherwise, an adapted EF mount lens is the option. The Canon Mount Adapter EF-EOS R (or one of the variants) makes this easy and maintains the adapted lens' native performance. There is a cost to the adapter and it adds .9" (24mm) in length and 3.9 oz (110g) in weight to any lens being adapted. The Canon EF 50mm f/1.2L USM Lens, what I consider the RF 50 F1.2 L's predecessor, is the most obvious comparable lens. In the image quality comparison at f/1.2, the RF lens is the noticeably sharper lens and it remains so at narrower apertures. The EF lens has slightly less vignetting and with 8/6 lenses/groups vs. 15/9, it also shows modestly less flare effects. The RF lens is practically linear distortion-free while the EF lens has slight barrel distortion. Looking at the specs and measurements, the Canon RF vs. EF 50mm f/1.2L USM Lens comparison shows the EF lens significantly smaller and lighter with smaller filter threads (72mm vs. 77mm). The RF lens has 10 aperture blades vs. 8 and a higher maximum magnification (0.19x vs. 0.15x). The RF lens has a focus limiter switch, a feature unique among the lenses I'm comparing here. All will appreciate the EF 50's significantly lower price. Should I get the Canon RF or EF 50mm f/1.2L USM Lens? 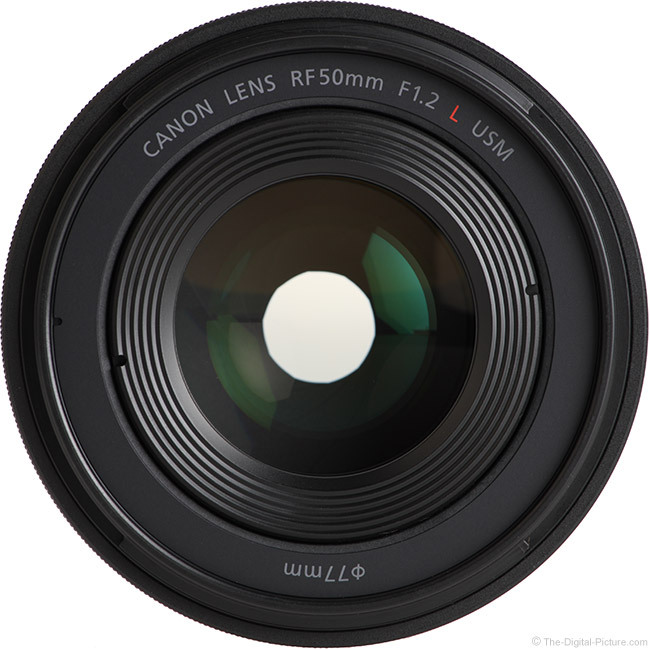 If you are serious about your photography and your budget is adequate, the RF lens is the easy recommendation. The next best autofocus 50mm lens option is the Sigma 50mm f/1.4 DG HSM Art Lens. This lens (and all of the lenses following) gives up a bit of max aperture to the Canon RF lens. In the image quality comparison at f/1.2 vs. f/1.4, we see the two performing similarly in the center and the Canon sharper in the mid frame and corners. By f/2.8, the lenses are appearing quite similar. The Sigma has less vignetting. Looking at the specs and measurements, the Canon RF 50mm F1.2 L USM Lens vs. Sigma 50mm f/1.4 DG HSM Art Lens comparison shows these two lenses being rather similar. The Sigma is slightly lighter and smaller, but not weather sealed. The Canon has one additional aperture blade, 10 vs. 9. The Sigma is considerably less expensive. Give up autofocus and the Zeiss 50mm f/1.4 Milvus Lens is a quality alternative. The image quality comparison at f/1.2 vs. f/1.4 shows the Canon RF looking considerably better, with noticeably less spherical/axial CA. By f/2.8, the lenses are appearing quite similar. The Zeiss has considerably less vignetting but more barrel distortion. Looking at the specs and measurements, the Canon RF 50mm F1.2 L USM Lens vs. Zeiss Milvus 50mm f/1.4 Lens comparison shows the two lenses similar, but the Zeiss being slightly lighter and smaller. The Canon has one additional aperture blade, 10 vs. 9. The Zeiss uses considerably smaller filters, 67mm vs. 77mm. The Canon has a higher maximum magnification, 0.19x vs. 0.15x. You'll recognize the theme here: the Zeiss is considerably less expensive. Zeiss also has an ultra-premium lens entrant in this class, one that is priced far higher than the Canon. That is the Zeiss Otus 55mm f/1.4 Lens. We have not yet tested the Otus on an ultra-high resolution camera, but in the image quality comparison at f/1.2 vs. f/1.4, it appears these two are competing very closely. The Zeiss has less vignetting but more barrel distortion. Looking at the specs and measurements, the Canon RF 50mm F1.2 L USM Lens vs. Zeiss Otus 55mm f/1.4 Lens comparison shows the Zeiss to be larger and heavier than the Canon. The Canon has one additional aperture blade, 10 vs. 9. 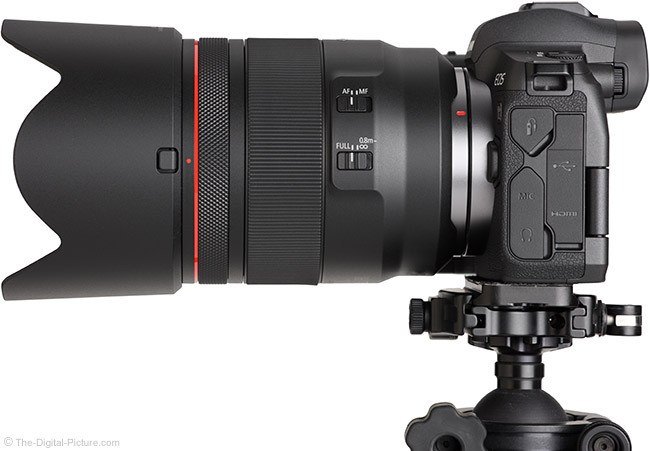 The Canon has a higher maximum magnification, 0.19x vs. 0.14x. 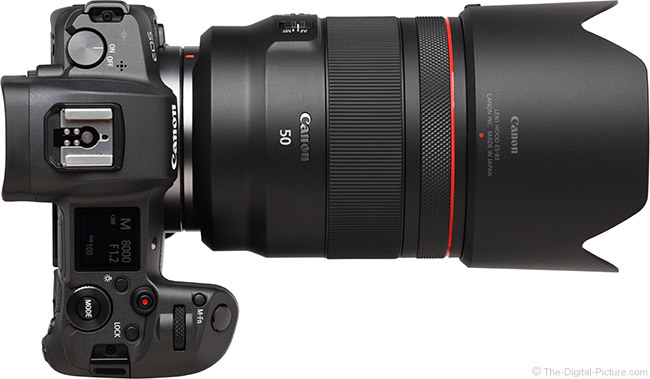 A great 50mm prime lens has been high on the want list for many photographers and with the RF 50mm F1.2 L USM Lens, Canon has delivered big. While the price may keep such a lens on the want list for those with a tighter budget, many serious amateurs and professionals are going to find this lens to be an essential part of their kits. The 50mm focal length has great general purpose utility and the ultra-wide aperture extends this lens' versatility to ultra-low light levels. Just having an ultra-wide aperture does not mean that the wide-open image quality will be adequate for your needs, but there is no worry when using this lens at f/1.2. 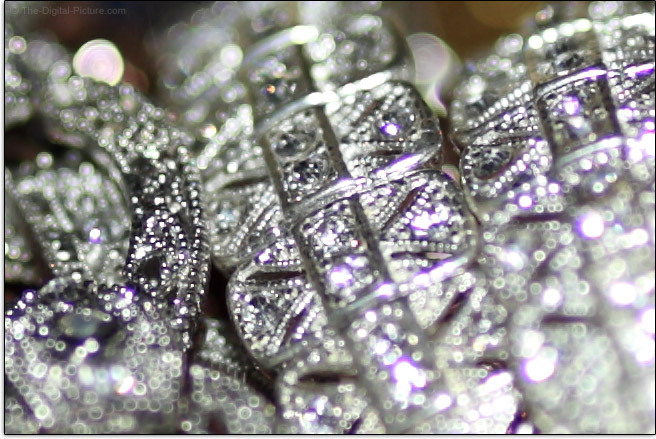 The resolution and contrast are great, far better than any other Canon 50mm lens. AF accuracy is critical for lenses delivering shallow depth of field and this one performs impressively. The Canon RF 50mm F1.2 L USM Lens is very fun to use, the results are equally fun to view and this lens alone is a great reason to buy an RF mount camera.